Your map marker will be moved to the Grove of Trials. 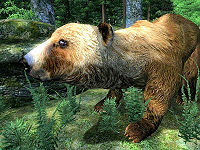 Proceed to the grove and after a couple of minutes an oversized bear named Forest Guardian will approach and attack you. Do not fight back. The Guardian will stop attacking after several seconds as long as you do not attack back. 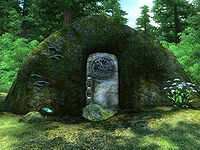 After this, the bear will stop and a stone will move to reveal the door to Kynareth's Grotto. This page was last modified on 9 December 2018, at 20:29.